This is what I have in my mind trying to explain what I am doing and what the customer is paying for. This entry was posted on February 18, 2012 at 20:04	and is filed under No Category. You can follow any responses to this entry through the RSS 2.0 feed. You can leave a response, or trackback from your own site. Value is a benefit to the client and while we typically try to put a heads reduction around this (like we’ll save this much time at month end), a lot a benefit can be argued against the risk of the book. For example, a customer could spend 2% of revenue to understand how its generated and apportioned to expenses. Do you “always” advocate the creation of a physcial data mart ? 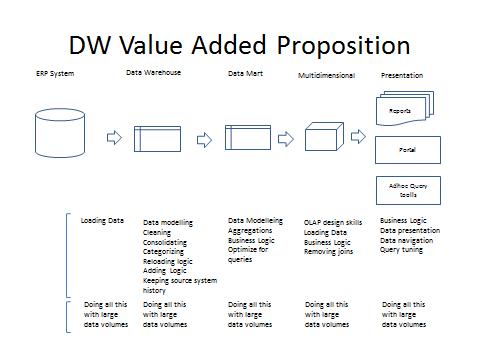 Interested in the pivot points that drives the need to create one on top of the data warehouse. More often that not I tend to go straight from data warehouse into Analysis Services, without the need for a data mart. The data mart can be views on top of the data warehouse of physical tables. The starschema mart model is good for compression in Power Pivot, column store indexes and BISM tabular. Less joins and more redundancy with starschemas that also aggregate DW data!